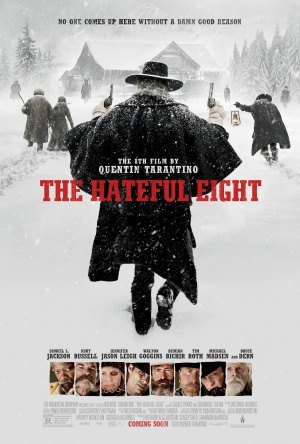 The film is split into six chapters, and stars Tarantino regular Samuel L. Jackson in the main role as bounty hunter Major Marquis Warren, as well as a strong supporting cast consisting of Kurt Russell, Jennifer Jason Leigh, Channing Tatum, Tim Roth, and numerous others, all of whom play their parts well, despite some weak characterizations within Tarantino's script. The director is not exactly known for having short run times, and at 167 minutes, The Hateful Eight is no exception. It's easy to sum up the flow of things: the film has a good start, a fantastic climax, but the middle portions are not consistently interesting. One moment you're enjoying some good humour, amusing and equally clever mystery scenarios, and some truly dedicated performances, whilst the next you're enduring some sleep inducing, meaningless scenes that exist to simply to drag out the run time for no logical reason. It becomes truly absurd how stretched out certain scenes are due to confusing and fluctuating character motivations and actions, which in turn causes frustration and severe boredom. Certain scenes serve no true purpose in the long run, and some of them seem to exist only for Tarantino to demonstrate his talent for penning eclectic and amusing dialogue. Whilst his talent is evident, it feels slightly pretentious and pointless to sit through certain scenes that seem to exist only to show off. But as I said, the introduction is strong, with a humourous and likeable introduction of the characters, and the climax is perhaps one of the finest moments, deftly blending thrills, an element of mystery, some engaging plot twists, and a plenty of controversial humour into a brilliant conclusion. Jackson shines in the main role with, again, a laugh a minute yet equally threatening personality, producing much of the film's comedy yet also being a strong, intimidating presence. Tarantino also incorporates his trademark love of gore and violence, which leads to some shocking yet equally thrilling (and often hilarious) shootouts and fight scenes. The Hateful Eight isn't a masterpiece, and in fact the brutal run time and sluggish pace in the middle make for some incredibly dull moments, but all in all it's another satisfying and generally entertaining movie from an acclaimed director that is sure to please his loyal fans.